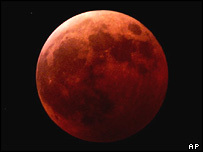 The Moon could turn blood-red during a total lunar eclipse in UK skies, the Royal Astronomical Society has said. The total eclipse will already be under way as the Moon rises on Tuesday evening but will only become visible as the Sun sets and the sky darkens. A dim reddish-brown Moon should climb slowly above the south-east horizon. Society member, Dr Jacqueline Mitton, said: "Lunar eclipses are a fascinating and beautiful phenomenon, and no two are quite alike." The total eclipse will begin at 2052 BST and end at 2208 BST. Dr Mitton said: "If the weather is kind to us, this could be a very interesting sight, with the eclipsed Moon becoming more and more obvious as the sky gradually darkens after sunset and the Moon gets higher in the sky." The Moon travels through the long cone-shaped shadow the Earth casts in space. The only light that can reach the Moon's surface at this point has been refracted through our planet's atmosphere. This light takes on a red tinge - depending on the amount of dust in the Earth's atmosphere. In November last year, a total lunar eclipse was visible from Europe, Africa, the Americas and much of Asia. The BBC weather forecast for Tuesday night is for rain over Scotland and Northern Ireland, extending to much of Wales and parts of south-west and north England. Showers elsewhere will fall back to coastal districts of the east and south. It will become mainly dry in many central parts of England and Scotland. "Lunar eclipses offer an unforgettable sight"